Abraham and Lot had experienced hard times together even before their journey to Canaan. Lot's father, Haran, had died years earlier in Ur, and Lot seems to have joined his uncle Abraham and grandfather Terah. It becomes apparent that Abraham adopted Lot. They traveled together, and they worshiped together. Abraham and Lot became like father/son. They shared a bond of blood, friendship, and love. They had seen God's provision for them through their many experiences together - both good and bad. unto the place where his tent had been at the beginning, between Bethel and Ai; Unto the place of the altar, which he had made there at the first: and there Abram called on the name of the Lord." Immediately upon arriving at Bethel, Abram seeks fellowship with the Lord. He seeks restoration from the experience in Egypt. Abraham and Lot had encountered the Pharaoh of Egypt, one of the most powerful individuals in the world. Abraham and Sarah had suffered a traumatic experience. Although restored to the Lord, Abram began to experience conflict on a new front. Genesis 13:5-11 tells the story of the separation of Abraham and Lot. As Abraham and Lot had both traveled to Egypt, Lot no doubt had acquired much wealth for himself through his uncle Abram's good fortune. The herdsmen of Lot began to come into conflict with the herdsman of Abram, which seems to have led to conflict directly between Abraham and Lot. 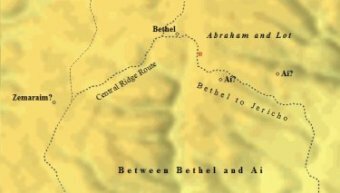 Abraham & Lot pitched their tents between Bethel and Ai. Internal strife would've been visible to everybody in Abraham's house. If perceived by neighbors it could be taken as a sign of weakness and vulnerability. Verse 7 makes it a point to state; "the Canaanite and the Perizzite dwelt then in the land." Tensions were high, and Abraham shows a side that will be seen later in his life when arguing for the populations of Sodom and Gomorrah. Abraham becomes a peacemaker, a negotiator among men. He urges Lot to choose a direction. Lot can go freely with all his herds, servants and other numerous possessions. If Lot goes to the left, then Abram will go to the right. As the oldest member, and head of the family, it was clearly Abram's right to choose first what land he wanted for himself. However, Abram shows his humility and his relationship with YHWH. He allows Lot to choose. Lot hastily looks up and takes notice of the plain of Jordan, where sat five prosperous and wealthy cities. These cities represented the heartland of Sodomite society. A difference in character between Abraham and Lot can be seen through Lot's decision, and Abraham's reaction. "And Lot lifted up his eyes, and beheld all the plain of Jordan, that it was well watered everywhere...even as the garden of the Lord...Then Lot chose him all the plain of Jordan; and Lot journeyed east; and they separated themselves the one from the other." What is interesting is the reference to the Garden of Eden . It has been suggested by scholars, such as Henry Morris, that Abraham possessed the writings that contained the "book of the generations of Adam". The story of a beautiful and luxurious garden would have been well known, and is alluded to here in this passage. It is also likely the wickedness of the inhabitants of the plain of Jordan was well known to Lot as well. Abraham and Lot were familiar with many different gods and belief systems. The Bible states Terah worshiped other gods, and consequently Abraham came from an idolatrous background steeped in traditions from ancient Sumeria and possibly Egypt. Perhaps Lot was reminded of "the land of Egypt" when he gazed at the plain of Jordan, and sought after the same luxurious lifestyle. Abraham and Lot had been living a nomadic lifestyle for a number of years. They lived in large canvas tents, spending most of their time in the desert. They stayed on the move as nomads, though Abraham dwelt primarily in Beersheba and Mamre, or Hebron. At first Lot did not abandon his nomadic lifestyle completely. He did not dwell in the actual cities themselves, but we are told in verse 12 that he "pitched his tent toward Sodom." He lived in the outer regions of the immediate cities, and enjoyed the wealth they provided without direct contact with day to day city life. Yet, as the Genesis narrative progresses, Lot becomes much more involved in the affairs of Sodom. Abraham and Lot become entwined with the fate of these wicked Cities of the Plain. Genesis 14:12 makes mention of Lot living in Sodom. The king of the city rebelled against his Mesopotamian master, who in turn invaded the land plundering his way down the King's Highway and into the Plain.Thousands were slaughtered. Lot was captured and carried off with all his possessions. In Genesis 19:1 Lot is seen sitting in the gateway of the city, a place reserved for the business leaders of the community. Thus it seems Lot moved closer to the city, or at least had taken a leadership role in the city as those were the ones at the city gate. Lot teeters on the edge of losing favor with God. Only Abraham's bargaining with YHWH Himself would save Lot and his family. SHARE YOUR THOUGHTS ON ABRAHAM AND LOT. Do you believe Abraham really existed? What are your insights into the lives of Abraham and Lot? Click on the above link and share your insights, comments, and questions with us! Abram, however, dwelt almost exclusively in the hill and desert country of the Negev, translated in the King James simply as "the south". Abram's lifestyle was much more rugged than Lot's. He was also much more secluded, as he dwelt in the land tucked away from the more densely populated regions of the plain, the seacoast and the Jezreel Valley. As Abram was living in the hill country God once again spoke to His servant and confirms His promise of future blessing. "And the Lord said unto Abram, after that Lot was separated from him, Lift up now thine eyes, and look from the place where thou art northward, and southward, and eastward, and westward: For all the land which thou seest, to thee will I give it, and to thy seed for ever. And I will make thy seed as the dust of the earth"
One can imagine Abram standing on the elevated peak of Mt. Hebron, staring out in all directions, imagining the time when God's promise would be fulfilled. Not only would all of this land be his, but his offspring would be as numerous as the dust. This was a supremely important promise to Abram. For up to this point in time, he had been without a son. In fact, scripture makes note of this early on in Abram's story. "But Sarai was barren; she had no child." These words were spoken right before Abram and Terah left Ur. This had been a burden on their marriage since the earliest days of their relationship. For whatever reason, God had withheld a child from Abram and Sarai. "Arise, walk through the land in the length of it and in the breadth of it; for I will give it unto thee." Abram descended from the hill country into "the plain of Mamre", which is said to have been in Hebron. Hebron, of course, was not known by this name at the time of Abraham and Lot. It is believed this bit of information was added by Moses to identify the location to future readers of the narrative. 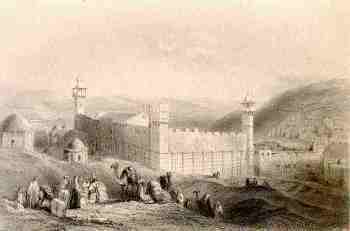 Regardless, Abraham and Lot had called Hebron, and its surrounding area, home for quite some time. Bible scholars and linguists argue this is common practice in Genesis, as current names were used to help identify ancient locations. The newer versions of the Bible translate this phrase, "plain of Mamre", as, "terebinth grove of Mamre". A sketch of ancient Jerusalem, the capital city of Israel today. Mamre receives its name from an Amorite chieftain who had settled there earlier. Genesis 14:13 briefly describes this man as having two brothers, Eshcol and Aner, both of whom are allied with Abram. Abraham and Lot would have formed bonds with the local inhabitants of Canaan. Abraham clearly enjoyed good relations with his local Canaanite neighbors. Abram, as he had done previously, built an altar to the Lord. This was to be home for Abraham and he wanted a place to worship his God with his family. He was ready for a peaceful, stable existence. In Mamre, historians claim that Abram lived in quiet and security for some years after his split with Lot. Though Abraham and Lot had parted ways, it is most likely the two kept in close contact. Archaeology has shown that Canaan was a peaceful land in these times. Excavations at biblical sites such as Shechem, Bethel, Hebron, Ur, and Haran have proven these cities to be as the Bible said during the time of Abraham. All the lands, from Syria through the Sinai, were known to have experienced a period of peace and prosperity. Jerald F. Dirks holds B.A. and M.Div. degrees from Harvard University, M.A. and Psy.D. degrees from the University of Denver, and a Sessions Program Certificate from Al-Imam Muhammad ibn Saud Islamic University. In Abraham: The Friend of God, Dr. Dirks constructs a chronological biography of Abraham, from a wide range of Judaeo-Christian and Islamic traditions, including the Bible, the Pseudepigrapha (i.e., Jubilees and the Genesis Apocryphon), the Qur'an, the authenticated sayings (Sahih Ahadith) of Prophet Muhammad, and the classic books of ancient history authored by Josephus and Al-Tabari. (review from amazon.com) Click on the link below to obtain your copy from amazon.com. It is the intent of this site to offer resources for you, the reader, that will enhance your understanding of God's Word, and the historical and social contexts of the times. Please support our sponsors if this product interests you. Any feedback you have is greatly appreciated. Just click on the Contact Us tab on the Nav Bar. Thanks and enjoy! Genesis 14 finds Abraham and Lot in the middle of an open rebellion. This chapter describes a scenario that was very common in the ancient world. 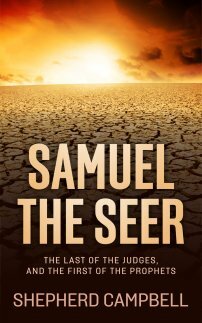 The region of Sodom and Gomorrah had apparently been paying tribute as vassal cities to Chedorlaomer, King of Elam. In the thirteenth year, the cities of the plain - Sodom, Gomorrah, Admah, Zeboim, and Zoar - all joined together in rebellion by refusing to pay the tribute. Chedorlaomer's response was swift and destructive. At this point history, kingdoms were small consisting mainly of city-states, and alliances and confederations formed amongst city-states. 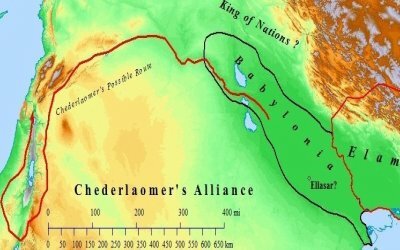 Chedorlaomer's confederation included: Amraphel, King of Shinar, or Babylonia; Arioch, King of Ellasar, the leading tribe in southern Babylonia; Chedorlaomer, King of Elam, the original kingdom of Persia, and also the leader of the alliance; and Tidal, who is said to have been King of nations, scholars have argued this is more than likely meant to represent a tribe of northeastern Babylonia. Archaeology has shown that such invasions occurred frequently in Bronze Age Canaan. Though these armies were small in comparison to later armies, they were nonetheless every bit as destructive. With an alliance of four kings, the size of this army was likely very large. A map of the lands involved in the alliance of the Northeastern Kings - those kings which joined Chederlaomer in his invasion of Sodom and Gomorrah. How the Cities of the Plain fell into the captive hand of Chederlaomer originally is not stated by the Bible. It seems logical the king had come to the region earlier and imposed such tribute. Chederlaomer and his crew came this time to leave an example rebellion would not be tolerated. According to the biblical narrative, the invading army destroyed all tribes north, east and west of the Salt Sea (The Dead Sea). Their victims included; the Rephaim , located in Ashtaroth east of the Sea of Galilee; the Zuzim, peoples living east of the Jordan River and south of Ashtaroth; and the Emim in Kiriathaim, east of the Dead Sea. These peoples, the Rephaim, Zuzim, and Emim, have similar names meaning, "giants", or "the terrible ones", "the mighty ones", "the powerful ones". They have been associated with the tribes of Anak. The Zumim are thought to be the same as the Zamzummin of Deuteronomy 2:20. These people are said to have been giants and a great people, very numerous and very tall. The sons of Anak have been identified with the Nephilim , found in Genesis 6:4. The Nephilim were a mighty people, proud and ferocious. They have also been associated with extreme evil. The pre-diluvian Nephilim were possibly the offspring of fallen angels and women. The tribes mentioned above, living in Canaan, were most likely the descendants of these Nephilim. Whoever these people were, the strength and brutality of Chederlaomer's invading force clearly overwhelmed the local population. Chedorlaomer continued his invasion as he marched this troops southward, where they conquered the Horites in Mount Seir. Archaeology has shown that these were the Hurrians, one of antiquities leading tribes of the Middle East. After smiting these people, the Northeastern Confederacy continued its destructive path by turning northward at El-Paran. From El-Paran, Chedorlaomer swept through the land heading northward, toward the cities of the plain conquering the land which would belong eventually to the Amalekites, descendants of Esau. The force also conquered a group of Amorites living in the region, and after taking Kadesh-barnea, moved into Tamar, where the alliance made camp. Abraham and Lot would soon encounter this terrifying army. 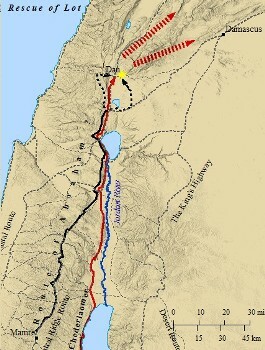 A map of the movements of King Chederlaomer's alliance as they marched down the King's Highway east of the Jordan, on their way to lay siege to Sodom and Gomorrah. From here the invasion force would meet head to head with the five rebellious cities of the plain. All the previous destruction had been on account of the rebellion of the King of Sodom, Gomorrah, Admah, Zeboim, and Zoar. It was four kings against five. Scripture relates that the battle was to take place in "the vale of Siddim". This phrase is interesting because it hints at the regions prosperity. Not only was the region rich in agriculture, but also in metals and bitumen, or "slime pits". Bitumen becomes petroleum, which becomes oil. Perhaps this is one of the reasons which made the area attractive in the first place to the invading Kings from the North. Black Gold was found in abundance in the region. This alone was enough to draw the attention of rivals. The result of the rebellion was disastrous for the cities of the plain. They were overwhelmed by the King of Chedorlaomer and his alliance. Scripture tells how the Kings of Sodom and Gomorrah fled and fell into the plain's slime pits. Those that did not fall into the pits, fled to the mountains. "And they took all the goods of Sodom and Gomorrah, and all their victuals, and went their way." Not only did they loot the cities, but they took captive the peoples living in and around the plain. This included Lot, all that he had and all those that lived with him. Some local residents, however, managed to escape into the surrounding forest and wilderness. Some fled to nearby cities, warning of the invasion. Some fled to caves in the Dead Sea area, where for centuries people have fled to and sought refuge in. These people eventually settled in new locations throughout Canaan. One such survivor, according to scripture, found his way to Abram in Mamre. "And there came one that had escaped, and told Abram the Hebrew; for he dwelt in the plain of Mamre, the Amorite, brother of Eshcol, and brother of Aner; and these were confederate with Abram." This is the first mention of the word Hebrew, and it is associated directly with Abram. This, of course, raises many interesting questions as to the exact ethnicity of the Hebrew, or Israelite, people. The word's origin is unknown, and many scholars have associated it with the name Eber , a distant descendant of Abram and the great-grandson of Shem. Others suggest it is associated with the Habiru . The Habiru are an extremely interesting group of people who seem to have had no national identity, no central government of any kind, yet represent a heterogeneous social element that was to be dealt with by local authorities, and even empires such as Egypt and Sumeria. Abraham and Lot, and their families, were labeled by the existing authorities of the day as part of the Habiru class of people. Thus, Abram was identified as "Abraham, the Habiru", living in Canaan. He and his nephew Lot had been through much together. Now, however, things had escalated as a marauding army had taken Abraham's nephew captive. Abraham was forced to rescue his nephew from imminent death or slavery. Tablets found at sites such as Ebla and from the ancient Hurrians at Mari contain biblical names such as Abram, Leah, Isaac, Jacob, etc. The tablets shed light on the Habiru and the daily life of individuals within this era of the Bible. These documents contain administrative and legal manuscripts that speak of similar events found throughout the biblical narrative. Whatever one's belief about the word, it was clearly used to distinguish Abraham and Lot from the other inhabitants of Canaan. As Abraham and Lot had prospered over the years financially, Abram had formed bonds with local leaders as seen in his pact with Mamre and his two brothers. Scripture later indicates that men from Mamre, Aner, and Eshcol accompanied Abram in his rescue mission from Lot. There is no hesitation in Abram's response to his finding out Lot had been taken captive. Abraham and Lot were family. Despite their earlier differences, Lot was like a son to Abraham. Thus, Abraham immediately musters every fighting man in his household. Scripture tells he mustered 318 fighting men, all of them trained in his own household. Notice the detailed number of 318 men. This detail adds authenticity to the account, as if an eye-witness counted precisely 318 men and felt it necessary to record the exact number of men involved. A map of Abraham's route on his rescue mission for Lot. Abraham and his men were successful in their rescue mission. Abram had become a well respected tribal chieftain, or king. Though scripture does indicate such, it would not be unusual for local men sympathetic to Abram to accompany him on his rescue mission. Thus, it is possible that some of the local Amorites joined with Abraham. Genesis 14:14 describes how Abram and his party pursued the invading army all the way to Dan. Dan was approximately 125 miles north of Mamre. It would seem logical that a force of such size would be easy to track through a country as burnt villages and fields surely dotted the landscape. Abram and his party would have encountered the dead bodies strewn unceremoniously in ditches on the side of the road. Abram had no choice but to trust God, as his force would have been severely outnumbered. Abraham shows his military prowess in this episode. He marched his men all night, catching up with the unsuspecting invaders near Dan. At Dan, north of the Sea of Galilee, Abram divided his forces and by night attacked the enemy. The enemy was completely taken by surprise. 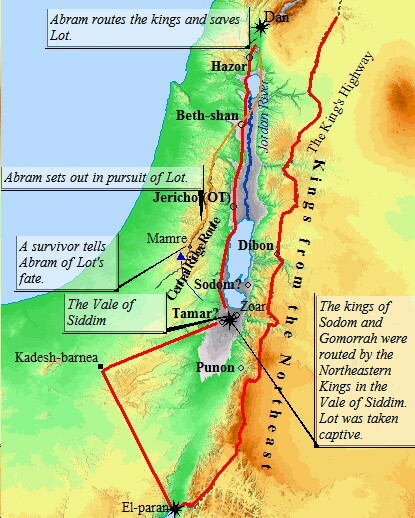 Scripture tells of Abram's army destroying the Northeastern Alliance, and pursuing them as far north as "Hobah, which is on the left hand of Damascus". Damascus is approximately 50 miles north of Dan, thus, Abram had journeyed a total of approximately 175 miles in pursuit of Lot. After defeating the armies of the four kings, Abram departed for Mamre with all of the stolen goods, including Lot and all of Lot's possessions. Abraham and Lot were reunited. Abraham's 318 men had trounced an alliance of 4 kings from Mesopotamia. These 4 kings had trounced a number of foes east of the Jordan, and then conquered Sodom and Gomorrah. How was Abraham able to come away victorious? Undoubtedly YHWH had something to do with it. Perhaps this is why Abraham encountered one of the Bible's most mysterious personalities on his way back from the operation - Lot, other captives and all of the spoil in tow. The King of Sodom went out and met Abram at the "valley of Shaveh", and even offers Abram all of the spoil he wants in return for the persons taken. Abram declines the Kings offer, stating he only wants "that which the young men have eaten, and the portion for the men which went with me, Aner, Eshcol, and Mamre; let them take their portion." Abram, instead, gives God the glory and encounters the mysterious personage of Melchizedek , whom scripture calls "the priest of the most high God". Melchizedek then blesses Abram in the name of "the most high God". In return, Abram tithes from his wealth to Melchizedek. This encounter has provoked much debate and many questions as to the identity of this priest, and how a priest of "the most high God" could have existed in Canaan before Abram arrived in Canaan. 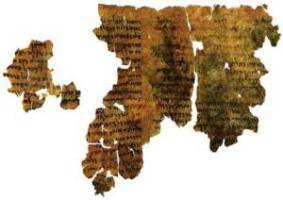 Abraham is believed to have been the only individual in Canaan worshiping God Almighty. However, Genesis makes it clear there was already a priest living in Jerusalem during the time of Abraham. Who this priest was, though, and the nature of his existence is unknown. Over four thousand years later the identity of Melchizedek has remained a mystery to this very day.